Risotto is one of those dishes that can look and taste amazing and uses only a few simple ingredients. It combines the flavours and lifts them up to new levels in my opinions, and I love how it’s so versatile. 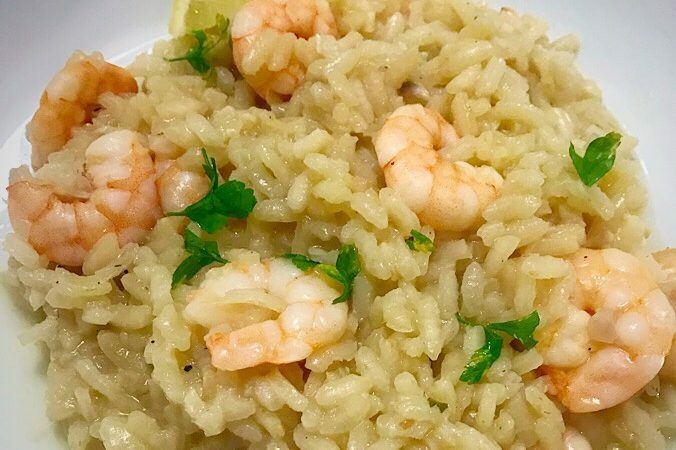 You can make it a simple comfort food like my butternut squash risotto, or you can make it fancy and indulgent like a lemon and seafood risotto. The choice is yours, it all depends of the ingredients you select. People often tell me that they don’t make it because it’s hard, but I strongly disagree. It is one of the easiest dishes ever in my opinion, it just requires a lot of attention and patience. Add the zest of a lemon plus half the juice to the stock. Set aside. In a pan melt 2 tablespoons of butter and add your onion and garlic, let it cook until the onion is translucent. At this point add the rice and stir, make sure every grain is covered with the butter. Once the edges of the rice start to become translucent add 1 ladlefuls of stock and stir. Once it has almost completely been absorbed add another ladleful and stir again. Keep doing this until the rice is cooked. The rice should never be dry, there should always be some stock in there, it should take around 17minutes to cook. It is ready when you can run your wooden spoon through it and it fills the space back up slowly, sort of like wave on a seashore. Once the rice is cooked add in one last ladleful of stock, some parsley, your prawns and Parmesan, the juice of the other half of the lemon and stir. Season with salt and pepper. Stir in some butter before serving and garnish with parsley. This is a dish that is best eaten straight away, however it can be reheated, but it won’t be as nice. Just add some butter and a dash of water before microwaving it.